This symbol of peace in Germany is on par with the Arc de Triomphe as a typical episode of the monument and move people the most in Europe. 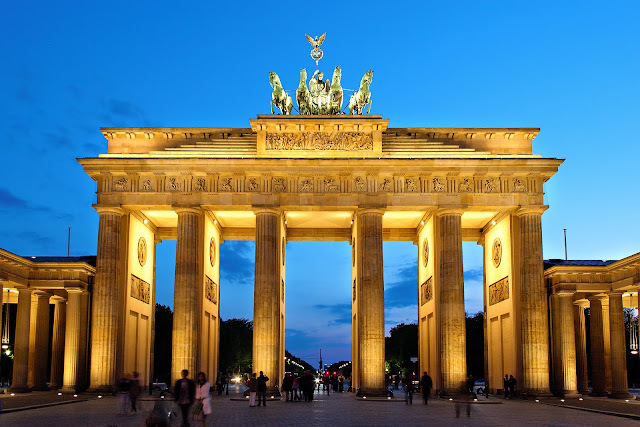 The history of the Brandenburg Gate - the great sandstone port in Neoclassical style - is a vital link in the history of Berlin and Germany. Built in 1791 to mark the Unter den Linden entrance, the biggest boulevards of Berlin, the original port is seen as a symbol of peace. 30m high, the Brandenburg Gate is designed based on the architecture of the Acropolis in Athens port. When Napoleon defeated the Prussian Empire in 1806, he held a parade to mark the victory through the city gates to enter Berlin, before winning the Victoria statue - the Godess of Victory - and bring to France as a trophy. Then Victoria was returned and now she was once again seated on her chariot on the gate. There is a period the gate was used as a propaganda tool of the Nazis after World War II and has been abandoned near the ruins at the border between eastern and western Germany. US President Ronald Reagan once had a famous speech about peace in this place in 1987. In December 1989, after Eastern and Western Germany was reunited, the port has been reopened for the transport and once again return as a symbol of unity. Before stepping through the gate, take the time in Raum der Stille (Quiet Room), a simple room, where people from every level, in every different religions are invited to leave all prejudice behind and sit down together. Upon crossing 1 in 5 epic aisle and mythological symbols of Greece, there is no strange if any visitors feeling overwhelmed; as history still present right here. You should find out the information recorded the history of the port, which has become a symbol through 200 years of existence. The gate always has the brave appearance, the scenery around here the more beautiful when the lights are lit every night and on the occasion of New Year's Day. Brandenburg Gate locates between the Reichstag building and the Holocaust Memorial, at the opposite of Tiergarten. Friedrichstrasse is also near the port, one of the commercial and cuisine streets of Berlin, and quite near the train station S-Bahn, U-Bahn.